Even though eels have been eaten all over the world, the sweet sauce added is the Japanese signature flavour. It is a little bit salty but not too salty, but not too sweet though. That indescribable moist texture has been gaining innumerable secret admirers. 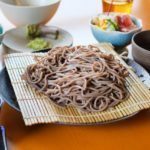 Eel is not only delicious but also is very nutritious. Why don’t you enjoy the flavour which makes you addictive and you can ease your fatigue from the trip and store your energy for tomorrow? 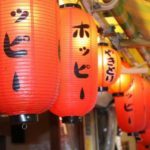 The [Kikusuiro] is a 120-year-old long-established Japanese cuisine restaurant found in front of the Ichi-no-Torii (shrine gate) of the [Kasuga Taisha] which is a sightseeing spot in Nara. 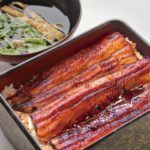 The [Unagiku] has set out to be a popular grilled-eel specialist at the Japanese restaurant, [Kikusuiro] which welcomes its honoured guests from all over the world. Even now they are using the flavour of the sauce which has been topped up for a long time. They are purchasing the best ingredients produced in Japan, cooking an enough amount which they need for a day, grilling them without any sauce, steaming them and finally grilling them again with the sauce on the charcoal fire. The menu has been prepared in English, Chinese and Korean, so foreign sightseers can visit the restaurant without any sense of hesitation! You will want to drop in there on the way to visit the Kasuga Taisha (shrine) for prayer, won’t you? 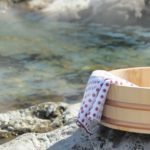 The [Unagi-no-Kawahara] has been particular about choosing the eel producing areas such as Miyazaki or the Kagoshima prefectures. They are considerate about describing the names of the eel producing places in order to make their customers eat their grilled-eels with a safe feeling. They let eels swim in the tank for a few days to remove the odor, cut them and grill them on the Bichotan (top grade charcoal produced from ubame oak) charcoal fire. It is the Kansai-styled grilled-eel. The crunchy texture of its skin and the crispy meat fill the mouth. The middle of its meat is fluffy. This harmony is created by the Bichotan charcoal. The Kansai-styled sauce with less-sweetness tastes pleasant and appetizing. If you want to eat the grilled-eel in the Nara prefecture, please visit this restaurant! 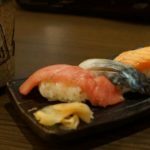 The [Unagi-no-Toyokawa] is familiar to everyone in its neighbourhood and is the friendly grilled-eel restaurant which has many repeat customers from a long way. You can enjoy an “at home” atmosphere in the small interior. The price is very gentle on your wallet, so you can enjoy some without any worry about the cost. The way of grilling and the sauce are both Kansai-style. The eels are grilled directly on the charcoal fine into the brown colour and finished with neither too sweet or too salty sauce. They have a variety of the side-dishes, so your chopsticks never stop moving even while you are waiting for the eel being served.Please make good use of this restaurant. The [Edogawa Nara-machi-ten] looks like a traditional town house, slipping back in time. Their Japanese styled garden which you can view from the inside of the restaurant reminds you of the garden in an old film. They firstly grill the eels produced in Japan without any sauce, steam them and then grill them. You can enjoy them with various side dishes, using the fresh ingredients with plain colours. You can taste the exquisite grilled-eel without spending a lot of money to adorn the last days of your trip. It would be enjoyable to recall your trip, drinking the Nara local sake together with the grilled-eel. If you are in group, you can use a private room. 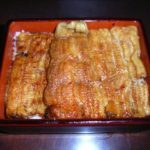 You can taste the grilled fluffy eel, using plentiful Genryoku-eel which is the brand of eel from the Mikawa in the Aichi prefecture at the [Ike Edo Yaki-unagi Asahi-tei]. They use 2 different types of katsuo-dashi (dried bonito stock) in the soup. Their detailed elaboration is sheer craftsmanship. Seeing is believing. The decoration of the inside shop, using the 350-year-old local cedar is creating a Japanese atmosphere and you can feel the warmth and also cleanliness. On the day when you want to have a little luxurious time, even though it may sting your pocket, please go in through the noren (shop entrance curtain). There is no doubt that you’ll be satisfied! The [Unagiryo Ikeike-tei] has a very friendly atmosphere almost as if you are going to your Grand-ma’s house to taste a grilled-eel. This restaurant has a Japanese-styled veranda, so it is said that you can experience an old Japanese house. The grilled-eel at this restaurant is done in the Kanto-style. The fluffy and soft texture is its characteristic. 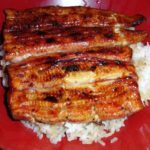 It doesn’t have the crispy texture which the Kansai-style has, but it could be interesting to have an eating comparison with other grilled-eel from other restaurants. At lunch time, they offer the reasonable menu in price. Please visit this casual restaurant where you can spend some relaxed time. 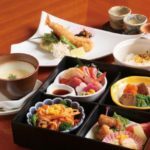 The [Daimon] is a grilled-eel restaurant with many people saying, “You can eat the exquisite grilled-eel.” which is a 10-minute-walk from the Tsutsui station. The characteristic of this restaurant is that they cook the eels in front of your eyes those that have been swimming in the tank. The safe feeling about the ingredients is 100%. Although they start cutting eels after they receive an order, they won’t make you wait very long. 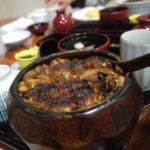 If you are not satisfied with the Japanese small dishes, they have the mega-una-don which contains 3 grilled-eels on rice. For people who want to taste Shira-yaki (grilled-eel without sauce) as well as Tare-yaki (grilled-eel with sauce), they offer 2 shoku-don (2 different coloured eels on rice). Even when you are travelling on your own, you don’t need to hesitate to enter this restaurant. Please drop in at this restaurant, if you are hungry. It takes about 20 minutes until you are served the Kansai-styled surface crispy grilled-eel. 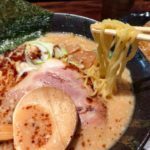 This long-established restaurant has had repeat customers since a long time ago. You need to make a reservation for sampling the eel-sashimi (thinly cut) which is a very rare item to eat. There are quite a few people who come all the way from afar to ask for this taste. In the same Tenri-city, there is the famous restaurant called Mishimaya. It could be interesting to have an eating comparison. Close: Wednesdays When it falls on 25th or 26th, we are open. The [Nikaku] is proud of its half century history as a grilled-eel restaurant in the Nara prefecture. They grill the eels firmly and steam them for a short time to finish. These eels are directly delivered from the Aichi prefecture. The style can be said to be the Kansai-style as well as the Kanto one which creates the fluffy melting grilled-eel. The popular [Shira-yaki-don] harmonizes its secret less-sweet sauce and the rice extremely well. You can sample the original taste of an eel together with the compatible fresh wasabi (horseradish). The 2 coloured rice bowl which contains grilled-eel with the sauce and the without one is recommended. If you get lost, please carry on walking, aiming towards the [Tsubai primary school]. Close: Sundays When it falls on a national holiday, we are open. As you can eat the grilled-eel for a reasonable price, not only the locals but also people from far way come and make a long queue. That’s the popular restaurant, [Mishimaya]. They are particular about the eels produced in Japan and you can sample the crisp as well as fluffy texture. Its original sauce, using the brown sugar is compatible with rice very well. The representative Kansai-styled grilled-eel for the Nara prefecture is here. As the interior of the restaurant has been refurbished, it is more comfortable than before. Its landmark is the painting which shows an eel as its motif. Each menu has got its own photo, so it is easy to understand for foreign visitors. Let’s taste the superb grilled-eel in the Nara prefecture! 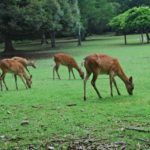 The Nara prefecture has many popular sightseeing spots, such as the Todaiji-temple and the Nara park. A lot of sightseers gather every day. 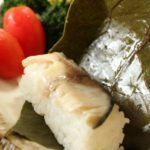 I’ve introduced the 10 recommended grilled-eel restaurants where you should eat in the Nara prefecture. All the restaurants which I’ve introduced have good reputations. So, please visit one or some of them! Of course, there are many other delicious gourmets, so please try them as well.